Nintendo's Wii U finally has a price and release date: The next-generation gaming console, which comes with a large touchscreen controller, will go on sale in the United States on Sunday, Nov. 18 for $300. A second, "deluxe" version will cost $350. That version has 32 GB of memory (the basic version has 8 GB) and a charging pad/cradle for the GamePad controller, plus some other extras. The basic version is white; the upgraded one is black. The Wii U console itself looks a lot like its predecessor, which launched in 2006 for about $250. The Wii U's big difference lies in its special wireless GamePad controller. It gives the bearer special powers, adding a new layer to both single- and multi-player games. The GamePad features a 6.2-inch touchscreen that works differently with each game. 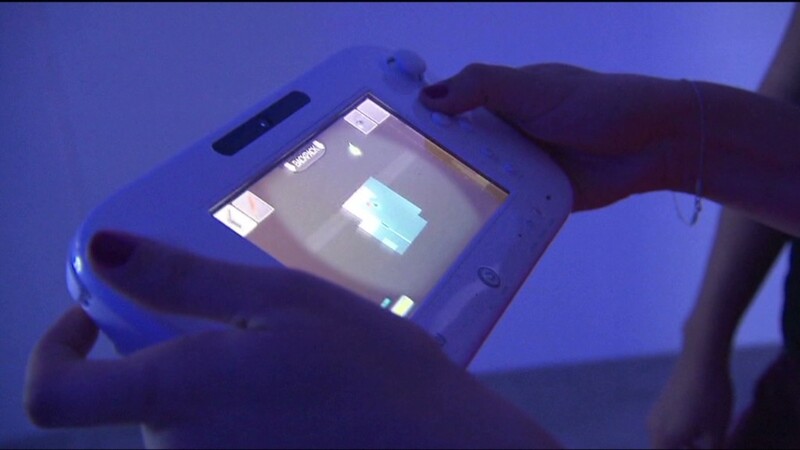 CNNMoney tried it out during a series of demos with Nintendo in New York City. With multi-player games the GamePad holder sees different things on the touchscreen than what their fellow gamers, who have regular controllers, see on the linked-up TV. In a chasing game that Nintendo showed off, players with regular controllers team up and try to catch the gamer with the touchscreen. The regular players simply see their avatars running around on the TV -- but the GamePad holder sees an overhead map on the touchscreen, which shows where everyone else is running. In its single-player mode, the GamePad adds some special features or interacts with what's happening on the TV screen. An archery game at the demo featured enemies that "jumped" off the screen and onto the GamePad controller if they weren't defeated quickly enough, giving the player a second chance at victory. A first-person shooter game used the GamePad for grabbing items. Players could also move the controller around the room to check out a special heat-map. Nintendo is hoping these special elements are attractive enough for a successful Wii U launch, as its last hardware release proved to be a misstep. The handheld 3DS system went on sale for $250 in March 2011, and its day-one sales beat records. But sales slumped over the next several weeks, and the Nintendo was forced to slash the 3DS' price to $170. Meanwhile, the idea of "casual gaming" -- which Nintendo helped invent -- has evolved to include mobile and social gaming. But Nintendo has consistently said it's not interested in putting its games on other platforms, even as gaming has exploded on Apple's (AAPL) iPhone and other smartphones, as well as on Facebook (FB). Related story: Microsoft versus Sony versus Nintendo. Who wins? Nintendo released a partial list of upcoming Wii U games, though as always, titles and launch dates are subject to change. For now, the planned slate includes a few Mario titles, a Wii Fit exercise game and Pikmin 3. Third-party developers like Electronic Arts (EA), Sega, and Ubisoft will also sell Wii U games, including titles from the "Mass Effect" and "Assassin's Creed" franchises. "Bayonetta 2" will be exclusive to Nintendo. The Wii will also have a Metroid title and "Call of Duty Black Ops II." In addition to games, the Wii U will offer some features for social networking and "Nintendo TVii" -- yup, that's really how they're spelling it. The TVii interface features streaming media apps from Netflix (NFLX), Hulu, Amazon (AMZN) and Google-owned (GOOG) YouTube. You can see what shows your friends are recommending and categorize content, and choose across platforms -- Netflix vs. Amazon, for example -- how you want to watch a show. When you watch live TV the GamePad syncs, showing scene photos and a one-sentence description. It lets you share you share your favorite moments on Facebook, take part in polls, and interact in other ways. Live sports gets a few special features, including built in integration with Twitter and Facebook for those who want to chat with other fans as they watch.